This article is filed under the CSS Basics category on this blog, but any developers who already use Sass on Windows can add their feedback, too. 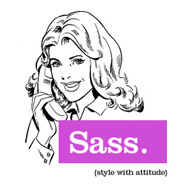 Overall, Sass is not difficult at all to get set up, even if you’re doing it on the command-line. But if you have no interest in going through all these steps, but still want to use Sass on Windows, well, just skip to the final heading in this post for a list of apps that let you start using Sass on Windows with minimal setup. 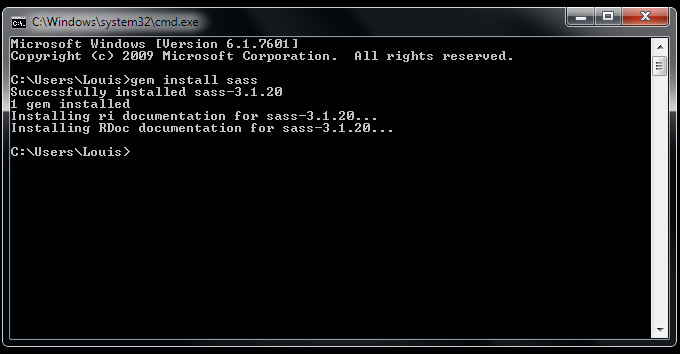 Because Sass is a Ruby gem, the first thing you need to do is install Ruby using the Windows installer. 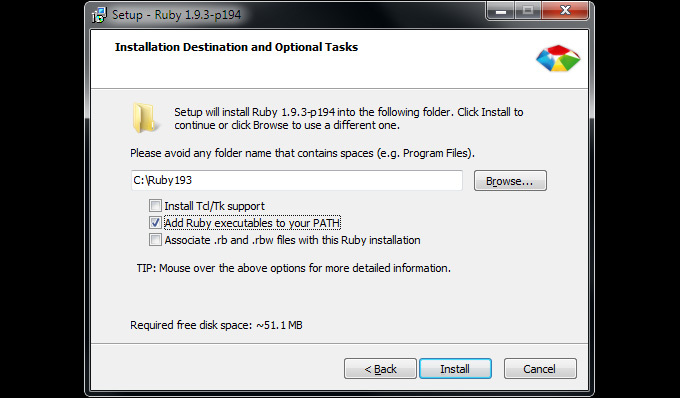 Unlike OS X, Ruby is not installed by default on Windows, so Windows users need to install it manually. From what I can tell, the only option that you need to check on that one is the middle option, which helps your command-line instructions recognize where to find (as it says) “Ruby executables”. Otherwise, you’ll get the error message “ruby is not recognized as an internal or external command” when you try to install Sass in the command prompt (see next step). If anyone has any other pertinent info on this particular aspect of the setup, then please comment and I’ll update accordingly. But that should be enough for the first step. If you want to have the added benefit of Compass, which is an authoring framework that uses Sass, you can instead choose to do “gem install compass”, which will install both Compass and Sass at the same time. I won’t get into the details on Compass here, but you can Google around for some info on that once you’ve started using Sass. Now that Ruby and Sass are installed, you want to tell Sass what file you’re working on and let it compile your CSS from your Sass file. 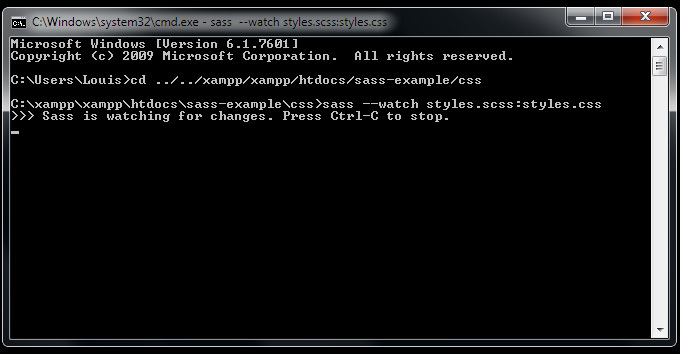 In the command prompt, navigate to the folder where you’re going to write your CSS using Sass syntax. This is not a tutorial on command-line syntax, so you’ll have to figure that out on your own if you’ve never done it. You can check out this link or just do a Google search for tutorials on simple command-line expressions. Notice that I’ve navigated using the “cd” or “change directory” command to locate the folder I’m working in. Now, using Windows Explorer, go into that folder and create a new CSS file with the extension “.scss”. So instead of the usual “.css” extension, you’re simply adding an “s” to the front of the extension. You can do this by either creating a regular CSS file and changing the extension, or by creating a blank text file and changing the .txt extension to .scss. Once your file exists, you want to tell Sass to keep an eye on it for changes, so it can compile it into a regular CSS file with traditional CSS syntax. You can copy the above code and paste it into the prompt by right-clicking and choosing “paste” (ctrl-V won’t work there). Ensure that “styles.scss” matches the file name that you chose when you created your new .scss file, and the same for the resulting .css file. Don’t worry that the .css file doesn’t exist yet; Sass will create it automatically. 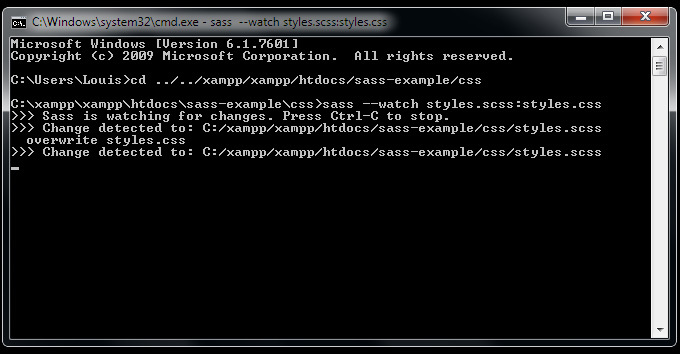 As you can see, Sass is now ‘watching’ your .scss file for changes. To stop the watching, just hit ctrl-C in the prompt. 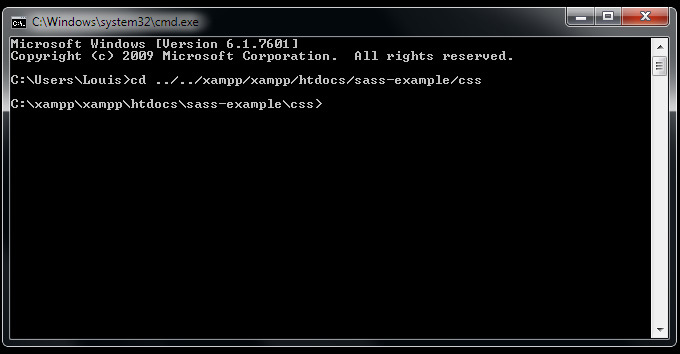 Notice that Sass has automatically detected the changes to the file and has produced a new file in the same folder. In that folder, you’ll see that new file, called “styles.css” (or whatever you named your .scss file). Open that new file in your text editor to see the compiled CSS. Now you can continue to write Sass-based code in your .scss file and Sass will keep detecting those changes and overwriting your CSS file every time you save the original file. Of course, keep in mind that in your HTML file, when you reference your CSS, you’ll point to your regular .css file. The .scss file is just for your editing, and doesn’t get used directly in any web pages. Skip Everything Above and Use an App! Originally, this post had a reference to Scout App, but that app has not been updated for more than 2 years and development on it has stopped. As far as I know, it’s quite buggy and shouldn’t be used. Use one of the above instead. There’s also Compass.app (http://compass.handlino.com/), which I use for writing SASS. It’s not free ($ 10,-) but I think it’s totally worth it. Thanks. I was going to include a mention of Compass.app, but figured someone would comment on it, and I didn’t want to make the post any longer than it already was. I’ll mention it in the upcoming Scout post though. I’ll definitely have to check it out. It’s really not expensive at all. Not sure if I’m the exception, but I absolutely loathe command line stuff. With that in mind, my personal opinion is that Compass.app is the best solution for Windows users (I also tried Scout but a “common” Java error kept me from continuing — a popular solution for that error did not help). Anyone serious about computer science should appreciate command line. And anyone serious about productivity and progress should appreciate GUI’s. Anyone serious about being serious about productivity should again appreciate command line. You can work much much faster in CLI than in GUI. Depends on the GUI, though, but as a general rule, customizing workflow in CLI is way easier than doing it in GUI. Thanks a lot for this article, it helped me out. Great website too, very clear. Hi, does the Compass.app include live-reload capabilities? If not, is there a stable Windows app that does? Thanks for a solid setup guide.. If anyone else has this issue, go to where you installed Ruby and find the “Start Command Prompt with Ruby” and then install from there. Awesome tutorial!!! Short and to the point! I am now a Sass Ninja!! Is this the same method for setting up Compas? Yes, see the last paragraph of step 2 in the article above. It mentions there that you can choose to do “gem install compass”, which adds Compass and Sass both at once. I like compile sass and compass width GUI. There is a greate gui for sass – koala(http://koala-app.com). Out of the box, and cross-platform operation.And it’s open-source. Thanks a lot, I like this app. Or just use Prepros App http://alphapixels.com/prepros which compiles less, sass, scss, jade, haml, stylus and markdown with Live Browser Refresh. ‘gem’ is not recognized as an internal or external command, operable program or batch file. I checked the Add Ruby Executables during installation. Thanks for the scout reference; checking it out. I love the command line, so much so I studiously AVOID windows cmd.exe. Installing/maintaining ruby on Windows is its own special endeavor, for that matter. Thanks for this. Been wanting to try out SCSS for a while now and haven’t, until today, come across a good, clear setup for it. 2. The command line was a breeze, no problem. I’m using Windows. I’m using Dreamweaver CS5.5. I have already configured the documenttype files to read scss and it works. What was the problem? Maybe your answer will help someone else. I believe it was a glitch in Dreamweaver. That same day I was having the problem, a pop up window appeared reading “I need an update for Dreamweaver”. Ugh! Please share standard deployment model used ? Is there a way to close it and still have it run in the background? AFAIK, you can do it if you use a tool like CodeKit, which does the command-line stuff in the background for you. Is there some reason you want to close the command prompt? Can’t you just minimize it? Thanks for the reply, ill check it out. Thanks for the easy to follow instructions! If it were not for these, who knows how long it would have taken me to figure out why I was getting the “ruby is not recognized as an internal or external command” message :). For Windows 7 64 bit should I use version 1.9.3 or a higher version of ruby? Use whatever is the latest version for Windows. Don’t pay attention to what’s in the screenshots in this post, this is an old post. I followed the tutorial but when I try updating the .scss file, there are no updates to the command prompt. It just says ‘Sass is watching for changes. Press Ctrl + C to stop.” What do you think is wrong? I’m not sure. Are you editing the right file, the one you’ve set it to ‘watch’? Are you in the right directory? What happens when you stop it and start watching again? Thanks! This was easy to follow and it worked! Thanks for the tutorial. I currently have a couple web sites that I’d like to monitor the .scss files automatically when I boot my machine. Is there a way to automatically have ruby/Sass monitor a specific set of files at boot without having to run the command line each time I work on a particular site? Hmmm, I don’t know. I think the only way that’s possible is if you have a native Sass app like CodeKit that runs on startup and then automatically starts watching. But I haven’t tried CodeKit so I don’t know if that one specifically would have that ability. Also, I’m sure there is a way to auto-run the terminal on startup with a specific watch command, but I’m no expert in that area, so you’d have to search around for a solution. Thanks for this article. I was struggling on how to setup SASS. I got the idea after reading this article. Thank you for your article. It was really helpful. What is the best website to learn SASS? I highly recommend Jump Start Sass. Best Sass beginners book on the market. Great post, this worked for me.Thanks. Yes, but how do you just compile a scss file ONE TIME? So many tutorials son how to watch scss using the command line,… how do you do a one time compilation? Well, I suppose you could just add the “watch” command once you’re done all your edits and make a minor edit to get it compiled just once. Also, there are tools you can use to compile, like Sassmeister.